If you're a beauty junkie like me you need Sephora Flash. I heard about it a while back but I missed out on their last offering. 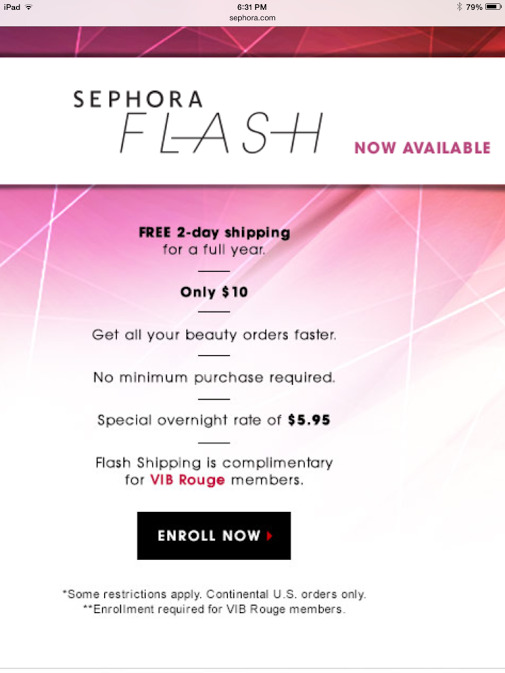 Right now Sephora Flash is available again so you need to sign up NOW and I'm going to tell you why. What is Sephora Flash? For $10 you get free 2-day shipping on any order no matter how small. And bonus - it's FREE if you're a VIB Rouge. I'm a basic Beauty Insider because I don't spend $1000 a year to hit Rouge, let alone $350 to hit VIB. Sign up for Flash here. Why is Flash so great? Now I can order any sale item I want without having to add additional items I don't really want to hit the free $50 shipping mark. Plus three free samples every time I order and if I hit the $25 mark there are always bonus offers like free deluxe samples and often they have a free fashion magazine subscription offer. So now instead of feeling pressured to order $50 I have to order $25 LOL. You can see more offers here. They update often so keep checking back. Don't forget Ebates! Right now you get an extra 4% back on Sephora Purchases. You can sign up for Ebates here. On Cyber Monday Sephora often has 8-10% cashback.